Extended breast-feeding did reduce the risk of a gastrointestinal infection by 40 percent….in real life, it adds up to about four out of 100 babies having one less incident of diarrhea or vomiting. ….What does all the evidence add up to? We have clear indications that breast-feeding helps prevent an extra incident of gastrointestinal illness in some kids—an unpleasant few days of diarrhea or vomiting, but rarely life-threatening in developed countries. We have murky correlations with a whole bunch of long-term conditions. The evidence on IQs is intriguing but not all that compelling, and at best suggests a small advantage, perhaps five points; an individual kid’s IQ score can vary that much from test to test or day to day. ….So overall, yes, breast is probably best. But not so much better that formula deserves the label of “public health menace,” alongside smoking. Given what we know so far, it seems reasonable to put breast-feeding’s health benefits on the plus side of the ledger and other things—modesty, independence, career, sanity—on the minus side, and then tally them up and make a decision. But in this risk-averse age of parenting, that’s not how it’s done. It’s an interesting read. Her takeaway is that breastfeeding is probably a good thing, but being manic about doing it exclusively isn’t really justified. 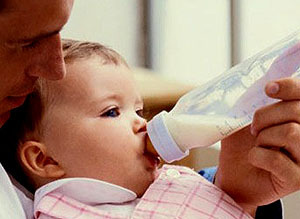 Letting Dad warm up a bottle of formula in 3 in the morning isn’t likely to do any harm, and the extra sleep might make you a better mother in the long run.